In what is the first sustained analysis of Marx’s attitude to the puzzle of the individual in history and society, this book, first published in 1990, challenges received views on the importance of class analysis and the place of a theory of human nature in Marx’s thought. The radical possibilities of individual agency in society are explored within a Marxian framework, and without recourse to the current fashions of methodological individualism or rational choice theory. In the context of the apparent antagonism between collectivist and individualist approaches to political explanation and social change, the author establishes that a ‘New Individual’, of singular importance for the understanding of contemporary society, can be identified. For the first time, the Grundrisse provides the basis of a major analysis of Marx’s thoughts on the individual. 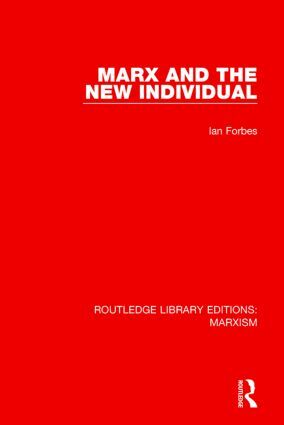 By illustrating the nature of the connections between collective existence and individual experience, Ian Forbes makes an important contribution towards the revitalization of socialist thought. He also develops a valuable counterpoint to rational actor models of politics and liberal theories of justice alike, by establishing the importance of a political theory that values human agency as much as it understands social and historical processes.